Yes! Both our AP Java and AP CS Principles course are officially approved by the College Board and our syllabi can be submitted easily for the course audit. Our pre-approved syllabus ID for AP Java is 1667173v1 , and our pre-approved syllabus ID for AP CSP is 1667172v1 . For more info on submitting the AP Java course audit using our syllabus, check out https://codehs.com/info/curriculum/apjava#course-syllabus. For more info on submitting the AP CS Principles course audit using our syllabus, check out https://codehs.com/info/curriculum/apcsp#course-syllabus. CodeHS is recognized by the College Board as an endorsed provider of curriculum and professional development for AP® Computer Science Principles (AP CSP). 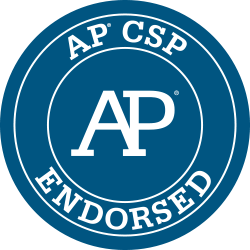 This endorsement affirms that all components of CodeHS‘s offerings are aligned to the AP Curriculum Framework standards and the AP CSP assessment. Using an endorsed provider affords schools access to resources including an AP CSP syllabus pre-approved by the College Board’s AP Course Audit, and officially recognized professional development that prepares teachers to teach AP CSP.